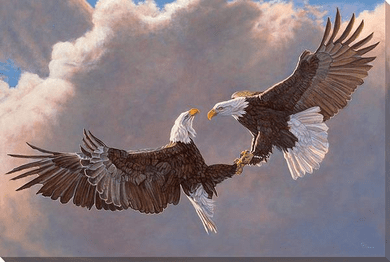 Home | New Releases | Gary Johnson Open Edition Gallery Wrap Canvas: "Clash of the Titans – Bald Eagles"
Gary Johnson Open Edition Gallery Wrap Canvas: "Clash of the Titans – Bald Eagles"
Size: 24"H x 36"W x 1-1/4"D.
Open edition wrapped canvas art print made from the original oil painting. Offering the character and texture of an original painting, our wrapped canvas art prints are beautifully printed with fade-resistant inks on durable high-quality canvas. The image wraps fully around the edges of each canvas. No frame needed! Arrives ready to hang. Made in the USA. Home | Fine Art Prints & Limited Editions | Wild Wings | Wild Wings New Releases | Gary Johnson Open Edition Gallery Wrap Canvas: "Clash of the Titans – Bald Eagles"
Home | Fine Art Prints & Limited Editions | Wild Wings | Gary Johnson | Gary Johnson Open Edition Gallery Wrap Canvas: "Clash of the Titans – Bald Eagles"